Description: U-KEEMAD south on the Barstow Sub. Description: Can I scrap this ugly Dash-9? PLEASE? Description: I've always dreamed of getting a shot like this. I only wish I had been more prepared for this opportunity. Description: Traffic Jam! 5 trains were needing to negotiate through Morris, right before dusk. 3 are in this shot. Description: Leading an empty coal train that just crossed over Lake Carlyle. 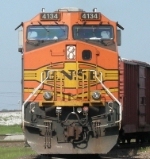 Description: BNSF 4134 leading a manifest into the BNSF yard in Galesburg. Description: NB BNSF coal train goes by the IC yard while the IC business train gets put away. Description: NB BNSF coal train goes by the IC yard while the little crossbucks that were used during RR Days are put away. They are in the truck by the building. Description: The famous Centralia Carillon sticking out just to the left of the exhaust stack of the 4134. Description: Crossing Fountain Creek is the Kansas City to Denver train with some east coast visitors.